We have always thought of XEX as a “discharging chamber”. 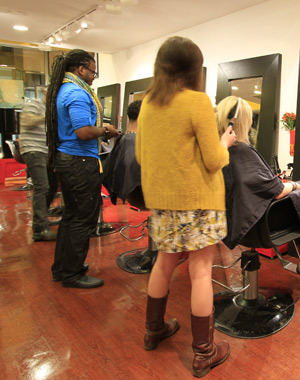 Our goal is for the salon to be a place where you can come in, de-stress, and receive exceptional service. While your stylist will need a couple of minutes at the beginning of your appointment for a brief conversation about your hair, after that the amount of conversation you continue to have with your stylist is up to you. If you’d prefer to browse the internet on your phone, read a magazine or simply enjoy a few minutes of silence, we really don’t mind. Our goal is for you to leave the salon refreshed, recharged and with a look you love! Have a suggestion for a way that we can make your experience at XEX even better? We’re always looking for feedback from our clients. Please leave a comment below or email us at info@xexchicago.com. Thank you!